We just got these in the mail! 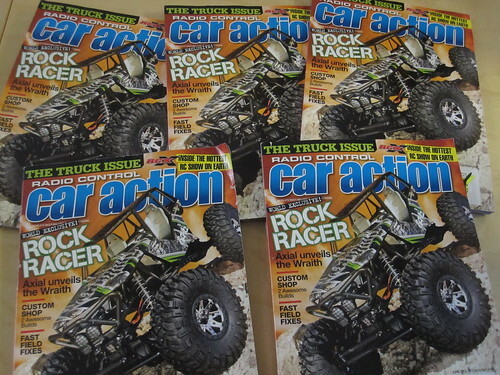 The June issue of RC Car Action magazine has the Axial Wraith on the cover and reviewed by RCCA’s Editor-in-chief, Matt Higgins. Also to check out in this issue is the Axial SCX10 Honcho Competition-Ready Scale Crawler article written by Matt Higgins and the Axial SCX10 based project in the RockPile department written by Kevin Jowett. 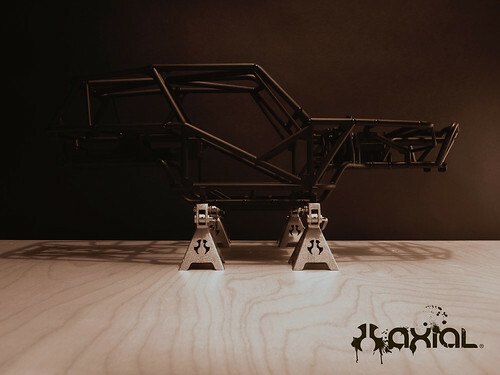 Axial Wraith™ Ready-to-Run 1/10th Electric 4WD Rock Racer The Wraith™ Ready-to-Run 1/10th Scale Electric 4WD Rock Racer is another “FIRST” for Axial with the first and most realistic full tube-frame chassis design that is manufactured with high strength composite materials. The Wraith™ is built to go fast and is NOT JUST A LOW SPEED ROCK CRAWLER. The Axial Wraith™ changes the game with its impressive 1:1 scale looks, high-speed monster truck “bashability,” and technical “crawl” capabilities. The Wraith™ is the most versatile vehicle satisfying the needs of a wide range of enthusiasts! The realistic looks, drivability and ready-to-run ease make this vehicle the perfect blank canvas for the enthusiast looking for a vehicle to build upon. The Wraith™ can go in so many directions; desert sand, mountain trail runner, rock racer, mud bogger and any form of backyard bashing that can be dreamed up! Within the 1:1 [full size] crawl & off-road race segments, overall tire diameters have been on the rise, literally and directly influencing the R/C crawl segment, thus this Axial Ripsaw reflects this attraction of flirting with rocks at speed with a compelling design that will give your rig the aggressive competition look and performance. R/C crawlers will clearly benefit with larger ground clearance where it counts as the Ripsaw measures 5.5″ [140mm] in diameter. This gives the lowest point on the 4X4 axle housing more clearance thus giving you many more tactical driving options in those sticky predicaments! Speaking of “sticky,” Axial offers the 2.2 Ripsaw in a R35 sticky rubber compound noted with a “white dot” on the outside carcass of the tire. This entry was posted in Wraith and tagged Axial, Axial Wraith, crawler, ripsaw tires, rock racer, Wraith by Axial. Bookmark the permalink. Great job Axial… by the way after finishing my SCX10 Dingo with all scale accessories wanna think about investin on Wraith..
Great job guys!! Looks great will have to get a review up on Axial Forums! Awesome truck Axial!!! I LOVE IT!!! Before I saw this, I was thinking about getting a G-Made R1 Rock Buggy, but then I saw this. I am defifinetly going to get it once my local hobby shop gets them in stock. GREAT JOB AXIAL!!! I LOVE IT!!! Where can i get a set of jack stands like that? 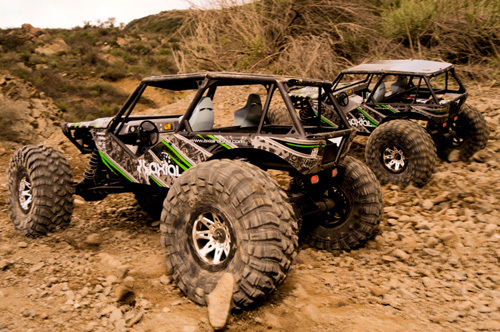 axial raceing is the best r c crawling manufacturer on earth. i have collected every crawler axialraceing has released. i carn’t wait 4 my WRAITH. Wow this is amazing axial, i am looking to buy my first one and dont no what to get, i like the dingo and the honcho and the wraith. i dont know what to get because i like ur new ripsaw tires to. two questions, the one truck u used to demostriaght the ripsaw tires, were do i get a winch bumper like that. Also were to u get jackstands like that. i think those are neat. hey whats the top speed? When will the Wraith be released on the market? After purchasing a Honcho months ago, I realized it was fun but not enough for what I was looking for. The Wraith is perfect. A scale crawler that is 3″s wider will have a great impact on real work drivability and performance. My names on the list at the local hobby store for the first shipment. Keep up the great work Axial, your making alot of us very happy. Grande mezzo , in Italia si aspetta con trepidante attesa il suo arrivo !!!!!! Have had some great fun with my Wraith.